Who says you have to wait for the holiday season to give presents? What if you could give someone a really special gift every single day that would cost you no money at all? And what if that no-cost gift could significantly change another’s life? Well, you could and it will. You can give YOURSELF as a “gift” to someone you believe in, love, admire, and respect by taking that person on as your Greater Than Yourself (GTY) Project. Think of the Greater Than Yourself approach as Extreme Mentoring, if you will. And to help you make this relationship official (whether or not you already have a GTY Project), we’ve created this Gift Certificate for you to use. I will Commit to a percentage of my weekly time to meet with you and counsel you. I will make a difference in your life by promoting your Welfare, Fortune, Success and Capacity for Achievement. I will invest in our relationship, share my “personal inventory” and ask you to do the same. I will discover your hopes and dreams, and demand of myself to commit to the achievement of your hopes and dreams at least as much as my own. 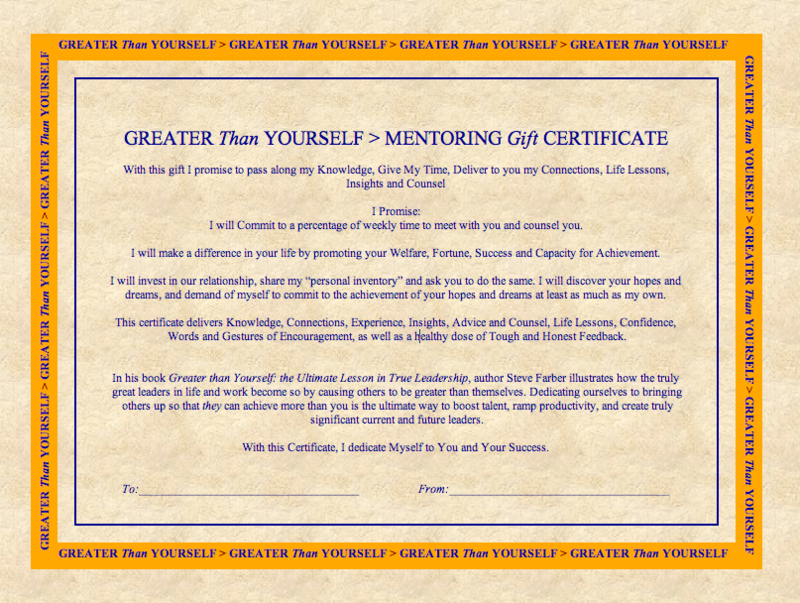 This certificate delivers Knowledge, Connections, Experience, Insights, Advice and Counsel, Life Lessons, Confidence, Words and Gestures of Encouragement, as well as a healthy dose of Tough and Honest Feedback. With this Certificate, I dedicate Myself to You and Your Success. So, go ahead. Download the certificate, print it out, sign it, and give it to that special person in your life. Just a heads-up, though…don’t be surprised if you ending up being the one receiving the greatest gifts of all. And by the way…if you still haven’t read Greater Than Yourself, you can find it here. Join me in San Diego for The Greater Than Yourself Experience!